Sixty years ago this week, Auschwitz, the largest and most infamous Nazi death camp, was liberated. BBC News explains what happened there. Auschwitz was the largest camp established by the Germans during World War II. More than a million people - the vast majority of them Jews - died there between 1940, when it was built, and 1945, when it was liberated. Hitler's Nazi regime intended to exterminate all the Jews in Europe - about nine million people when the war began. After experimenting with various methods, they settled on gas chambers as the most efficient. Auschwitz had four large gas chambers, in which people were poisoned with a gas called Zyklon B. 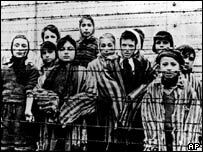 When prisoners arrived at Auschwitz, guards selected those who looked fit for work and sent the rest - children, the elderly, anyone who looked weak - directly to the gas chambers. Those who survived selection had their heads shaved, and numbers tattooed on their arms. They were assigned striped prison clothing and set to work. Inmates also died of malnutrition and disease due to the brutal conditions at the camp, and were shot dead by guards for any reason - or no reason at all. Life expectancy for those who survived selection was, on average, a few months. The Nazis also carried out quasi-medical "experiments" on inmates, including children. Many died as a result of inhumane tests on their endurance, exposure to heat or cold, and forced sterilisations. Were all the victims Jews? No, but most were. About a million Jews died at Auschwitz. Another 75,000 non-Jewish Poles, 18,000 Roma (Gypsies), and 15,000 Soviet prisoners of war were killed there. The Nazis also imprisoned and executed political prisoners, homosexuals, disabled people, Jehovah's Witnesses and anyone else they considered undesirable at the concentration camps and death camps they built. Where did the victims come from? Most at Auschwitz were Polish - Poland had the largest Jewish community in Europe at the beginning of the war. But victims were also brought by train from the many countries occupied by the Nazis or allied with them - including Hungary, Czechoslovakia, the Netherlands, Belgium and Yugoslavia. Why didn't the prisoners rebel? In fact, they did. Several hundred inmates learned in October 1944 that they were to be killed and rose up against the Nazis, killing three guards. They also blew up one of the crematoriums and a gas chamber with explosives smuggled in by inmates who were used as forced labour at an arms factory. The Nazis crushed the uprising, killing almost everyone who was involved. The women who smuggled the explosives into the camp were hanged in public. Was anyone punished for what happened at Auschwitz? Many of the people who participated in the Holocaust were put on trial after the war, including Rudolf Hoess, the camp commandant at Auschwitz. He was tried in Poland, sentenced to death and executed in 1947. About 750 of the 7,000 guards were also prosecuted and punished, but the search for Nazi war criminals who escaped justice goes on to this day. It is the German name for the Polish town of Oswiecim, near Krakow, where the camp stood. Why is Auschwitz in the news now? The 27 January 2005 marks the 60th anniversary of the liberation of the camp by the Soviet Union's Red army. When the camp was liberated, about 7,000 ill and dying prisoners were freed. The Nazis had partially destroyed the camp and taken about 58,000 inmates on a death march, fleeing the approaching Red Army. About 15,000 people died on the death march west. Why didn't the Allies bomb it? Have we learnt the lessons?